← Can I Have Some Extra Crazy, Please? Today’s photo of the day is brought to you, courtesy of my sister, Beth. She is definitely the funniest of the four of us, although, if I do say so myself, we’ve all been noted for our comedic timing. But, I digress. Here we have a still-life of her masterpiece, Elvis Banana. 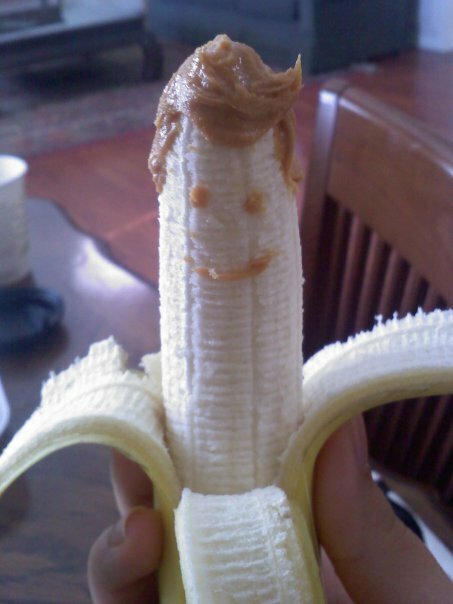 This entry was posted in Fun with Food, Just funny, Sisters and tagged banana art, elvis, elvis banana, elvis impersonator, funny, photos, sister. Bookmark the permalink. Have you ever had Elvis’ friend peanut butter and banana sandwich? Um, it’s amazing. I had it at the State Fair this fall — yum! That is amazing. And delicious. But how do you eat that adorable smile??? This is probably my favorite things I’ve seen on the internet lately!